Hiking is a fun, fresh way to get in your exercise and enjoy the great outdoors. To help keep your muscles in tip top shape and prevent injury, stretching should be incorporated before and after your trek, according to Vionic Innovation Lab member and fitness expert Juliet Kaska. 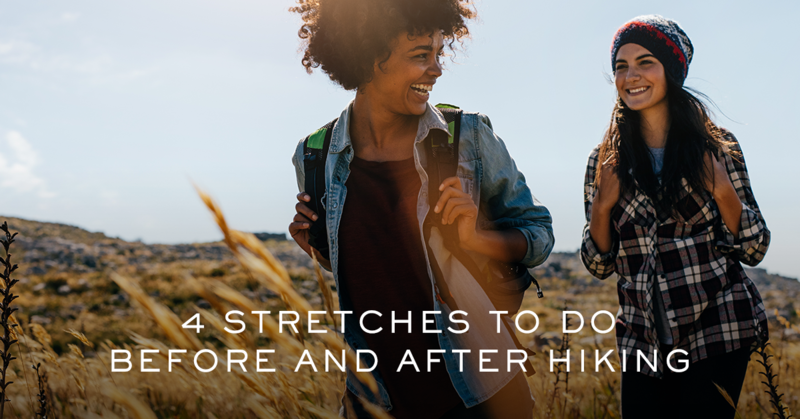 Before you head out the door on your next adventure, check out the stretches she recommends doing before and after your hike. Stand with your legs together, holding on to a sturdy surface with your left hand. Bend your right knee and grab ahold of your right ankle with your right hand. Keep your knees together, your abs drawn in and your tailbone tilted down throughout the stretch. Gently pull your right heel closer toward your right buttock. Hold for 1-2 minutes on each side, you can do this stretch multiple times on each side, before heading out for your hike. Stand on a sturdy surface like the sidewalk curb, holding on to a secure surface for balance. Place the ball of your foot on the sturdy surface with your heels hanging off. Lower your heels down till you feel a stretch in your Achilles tendon and your calf muscles. Raise your heels up as high as you can, then lower your heels down into the stretch. Do this 10-20 times to stretch your calf muscles and Achilles tendon, as well as warm up your feet and ankles. Sit down with your legs hip width apart. Without moving your right foot/leg, place your left ankle on your right knee with your left ankle flexed. Hinge forward at your hips trying to keep your back flat. You will feel the stretch in the outside of your left hip and buttock. Hold and breath for 1-2 minutes. Stand with your legs parallel. Step your right foot forward about 3-4 feet, or until you have to lift your left heel up. Bend your right knee to a 90’ angle (if you don’t feel balanced hold on to a sturdy surface with your right hand). You will begin to feel a stretch across your left hip flexor and quadriceps. To increase the stretch, tuck your tailbone down and your pelvis under. Reach your left arm up and overhead, laterally bending to the right. Once you hit the trails, make sure you have everything you need with our hiking packing list. Find out what to bring here.